Very satisfied! Love that it has no unpleasant smell and it really works! Just after one apply, I had a lovely sun-kissed colour. I do recommend it! I was so excited to use this due to the glowing reviews for fair skin. So I followed all instructions, I exfoliated and used a mitt when applying. Both times I’ve tried this, the tan has come out very streaky. It doesn’t seem to tan any large area and just goes to the darkest corner of my body, such as my arms (my wrist and in the middle where I bend my arm) and my legs (my knees and ankles - wow my ankles are so orange right now). It really smells too, even more so than other cheaper gradual tanners. 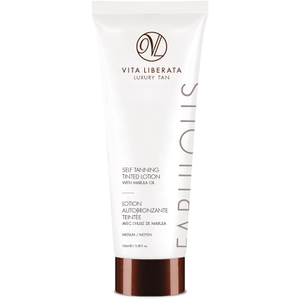 This is one of the best tanning lotions I have ever used, I got a subtle, nice tan after the first use. I am very pale and this product did not leave any streaks and the tan did not turn orange. There was also a very nice tan, my friends actually thought it was a natural tan from vacation. But beware - teh second time I used it, I was in a hurry and didn't follow the instructions as thoroughly as the first time. I got streaky all over my legs, especially on knees and ankles and had to cover my legs for the entire week. I am giving it 4 stars because of the smell. It stinks and the smell gets stronger by the hour. Nevertheless, the smell is still much better than when using other self-tanning products, I just would't advertise it as odour free (odour remove technology) as it is absolutely not true.I could smell it up to 24 hours after aplication. All in all, it is a great product, just be careful to follow the instructions. Will purchase again. I am so pleased that I received this in my beauty box, I absolutely love it! I am extremely fair skinned and this gives me a very natural looking flush of colour. I have since bought the full size version and will definitely continue using! Good product! After always using fake tan this is such a nice lotion to use to get a deep tan without leaving any residue on bedsheets or clothes and it moisturises too ! Ive got very pale skin and am constantly trying out new fake tans to get the best results. Recently ive started looking for a more natural solution so was delighted to find this in my beauty box! I applied it with a tanning mit and was surprised to find that a little goes a long way and no fake tan smell plus soaks in really fast! So far so good!! I woke up this mornong with a lovely glow, much more than i expected from 1 application!! Fab! The colour looks so natural, actually one of the best colours i have seen! Now the negatives.....the smell is definitely stronger...typical tan smell and follow the instruction about elbows and knees!!!! All in all a good choice though!! I'm bit of fake tan princess. But I hate to be too dark!! This is the Best gradual self tan I ve ever used. Only 200 MLS but last longer then you think. Little goes long way. Like the fact it doesn't have the usual smell when first applied then when it develops it gets more of that smell but nothing too strong so my boyfriend doesn't mind :) Ordered 3 rd one now. Doesn't go streaky what so ever!!! Even around the difficult areas. Neither need to be too careful. Will be reordering from now on!